“dist” is an abbreviation for distance. P1 is a point on a line segment and P2 is a different point on the same line segment. M is a point 1/2 the distance between P1 and P2, and represents an exact same distance from P1 or P2. Similar to the Distance Formula, to understand the Midpoint Formula we must consider a horizontal line segment, a vertical line segment and a line segment that has slope, is neither horizontal or vertical. 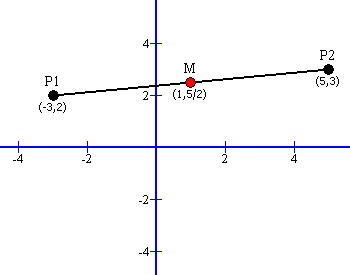 Please review the Cartesian coordinate image (above right) that illustrates P1,and P2, on a sloped line segment. M = ((x2 + x1) / 2, y1) where (x2 + x1) / 2 is the average of two x coordinate values. M = (x1, (y2 + y1) / 2) where (y2 + y1) / 2 is an average of the two y coordinate values.